Combien de fois ai-je entendu que, sans le séparatisme, Montréal serait toujours la première puissance économique du Canada? 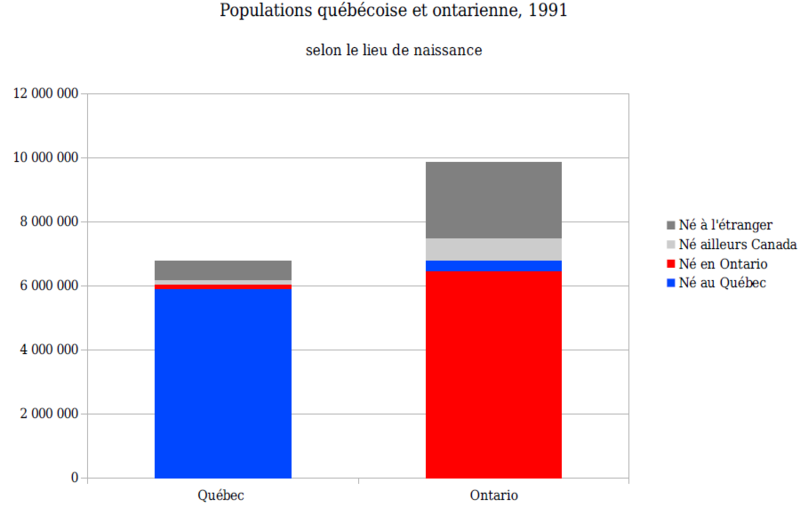 In 1991, in Québec, 146,315 persons living in Québec were born in Ontario and 591,210 were born in a foreign country. In 1991, in Ontario, 348,855 persons living in Ontario were born in Québec and 2,369,175 were born in a foreign country. Looking at the graph above, can we conclude that Toronto outgrew Montréal because of the exodus of Montréalers fleeing the political situation? Or should we conclude that the population of Ontario (and Toronto’s along with it) outgrew the population of Québec (and Montréal’s along with it) because of international immigration? Which raises the question : Why did so many immigrants choose Toronto over Montréal?